In the same way that you can set minimum height and width of rows and columns in a Grid, you can also set the maximum height or width. 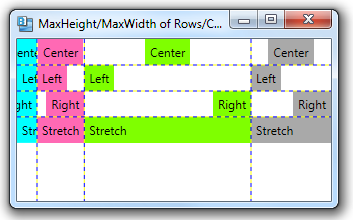 You set the maximum height of a row in a Grid using the MaxHeight property of a RowDefinition element. You set the maximum width of a column by using the MaxWidth property of a ColumnDefinition element.